Christ sakes- when will they EVER shut their Division 3 mouths?! They dont have anybody on their team like anybody on Navy and havent for about 8-9 years! Are you guys sure that you despise AF as much as these crybabies have been the last few years? Please don’t treat me like I’m from another planet, I’m just a new Navy football mom with questions. 1) Since DIV 1-A squads are limited to 105 and NAVY doesn’t “red-shirt” what does it do with the extra 57 on this year’s roster? Is that where the JV team comes in? Is that why there were 58 football recruits in this year’s plebe class? 2) Do the Varsity and JV players practice together? How is it possible for that many players to get the number of reps they need to stay sharp? 3) Who coaches the JV team when they play their games on friday afternoons and under what circumstances could a player be “brought up” from JV to Varsity during the season? 4) How many players will NAVY dress for a home game? Do they follow the NCAA limit for travel squads which I believe is 60 or 70 and if you are injured, are you automatically off the travel squad? 5) Other schools publish a complete depth chart (where the #5, #6 and even #8 guys are listed) so how does a player determine the progression at their position when NAVY stops at #3? I suppose these are questions I should have asked when my son and I took our official visit. At the time I didn’t realize NAVY would deviate so much from the DIV 1-A norm. Anyways, thank you in advance for your time. Not all schools publish a depth chart at all, much less eight deep. Alabama for one has no published depth chart. 1) JV squad comes from those numbers. Navy does not have scholarships so they are not limited to those numbers. Army and Air Force is the same. 3. Some of the coaches and all the coaches watch the game. He can be brought up if he is good enough. 4. There is no rule on how many players can dress for a home game. Navy normally dresses 100. Road usually 80. 5) I have never seen another school in the country post anymore than a three deep. Most post two deep or none at all (like alabama). Also, I’m pretty sure the coaches post a depth chart for everybody, but that isn’t released to the public. What good is it for the public to see that little Johnny is 8th string. I too am the parent of a new football recruit. For what it’s worth, here’s what I think……. There’s alot of attrition with the Navy football program. Compare the roster from the spring game to the roster from the fall scrimmage and you’ll see how many underclassmen left over the summer. Players can transfer to other schools, sit out a year and still have three years of eligibilty left. 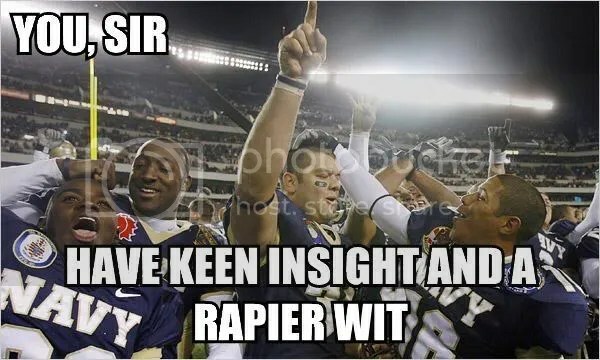 Also, Navy never knows until I-DAY if everyone they recruited will actually show up. So they OVER RECRUIT which is a double edged sword. It compensates for attrition but it also contributes to it because players don’t like standing around at practice waiting for reps and wondering, “Am I ever going to get to play here?” so they leave. My son started both ways for every game of his high school career; received all kinds of accolades; a national ranking; and had offers from two other schools but they were Div 1-AA so he chose Navy. As he left for the Academy I warned him, “Be prepared to be humbled because this isn’t high school anymore and you may not be the best player in the locker room…not yet anyways.” I felt it was important to remind him that he would be playing with guys that were the best at their high school too. BD- That Division 3 was intentional because – well thats the level they basically play at. If existing or not. You have some great questions and there are others here like BD that would have more inner knowledge about those answers. Does the new chop block rule impact Navy? I don’t know enough about it. Gary, … My best guess is a somewhat sarcastic/melodramatic way to say “Oh really???”. Thanks SO much for your responses (glad to know my questions were “great” and not dumb). The coaches do post a depth chart for everybody and my son is 6th (which is okay for a plebe) and his first day of classes (yesterday) went well so I WILL stop worrying! HI fbd- I get plenty of those types of replies on this board- I should know that (haha). New Navy Mom & Sports Fan- Best of luck to you and your Mids and I am sure we will be seeing them in the near future-help keep their heads up. What an honor and privilage it is to be a player on Navy! Actually, you are wrong about the rosters, Army and Air Force are not the same as Navy. Navy carries 160 / Army carries 220 / Air Force is a trim 105 which is in line with Div 1 Scholarship schools. Only a few AF players have duplicate numbers whereas almost everyone at Navy does and Army players are often three sharing a number. So, in terms of football, AF is much more selective. Large rosters are just bad business / kids waste away on the sidelines / get buried / burn out. Some kids are just dead weight. Not really into football just like the perks that make it easier to get thru the Academy – or so I’ve heard from my Mid. Navy is moving in the right direction (thanks to PJ) but KN should make further cuts. We’ll be better for it! No matter how much play time they will get in the end to say you suited up and were a Navy football player will hold large dividends in their future Academy-Navy and whatever final careers they choose. Always remember Rudy (ughhh even if he played for dreaded ND). Looking for ward to a great season- have I said at least 8 wins maybe 9 as my projection-will be at Pitt game. What an opportunity to knock off a Top 20 team it will be by then- I see upset special that day. Before we “bash” Army too much; let’s remember: we are better, when they are better. Of course, if they say something stupid; we should brace’em up with a celestial fix! Oh yeah that Mooney really looked great against Temple last night – like the rest of that “team”! 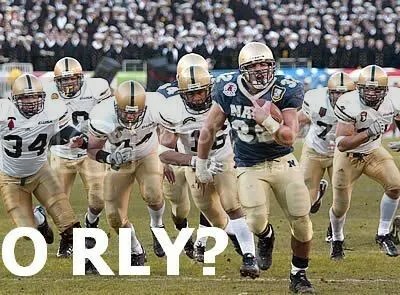 My God we have bad hIgh school teams that looked better than Army. This could easily be the last ranked team! They get New Hampshire next and they could lose to them too- the way they looked they could “run the table”! Even Brocks big mouth got shut when he said after 3rd qtr opening TD return- guess my halftime speech was not worth anything.